Wishing you all safe and fun Labor Day! A few more sales I came across. Baublebar || Labor Day Sale! Jewelry Styles Starting at 50% Off! Now - 9/1. These earrings are so fun for $15! And this cute bracelet is just right for $10. The Dreslyn || Take 15% Off Sitewide // Code: WHITE. Completely melted over this black and lace top. And this is the perfect and chic everyday tee. LOFT|| 50% off Select Full Price Styles and 50% off Sale Styles. Shop from 8/28 12a EST - 9/1 11:59p EST. This camo skirt is perfect for work. And this is a great little bomber jacket. Anthropologie|| Extra 20% off sale items! Over 600 styles added. Ends 9/1. This is a great high to low top. And I adore this top...easily wearable now through the fall. J.Crew || 40% off final sale items with code WEEKEND. Free Shipping on all orders on labor day (8/29-8/31). This clutch goes with anything and everything. These earrings! And these! I could wear these shoes everyday. Furbish Studio || 15% off everything // runs through Friday Aug. 29 - Monday Sept. 1. // Code: ENDOFSUMMER. I'm in love with this candelabra...pink candles and all. And this planter is so pretty. Lula and Georgia || 25% off! // Code: laborday25. In love with this brass tray. 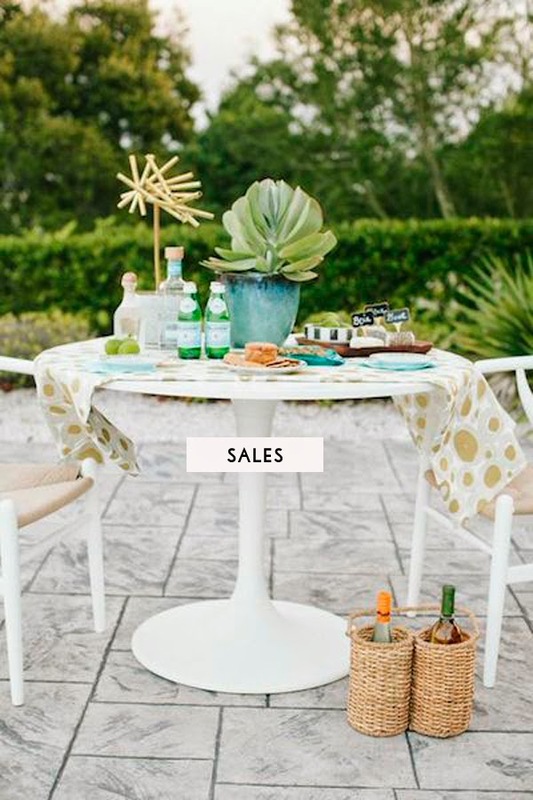 You have come across some great sales and what a lovely image. I've always liked this style of table! Enjoy Labor Day! Just way too many good sales this past weekend. My wallet is in a coma.